Dips do not always need to be savory! 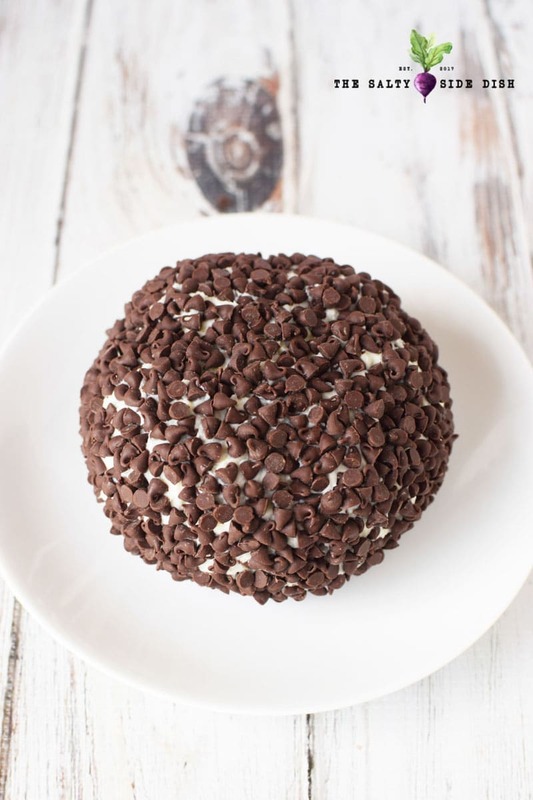 This chocolate chip cheese ball is the perfect dessert appetizer that will require double dipping for sure! 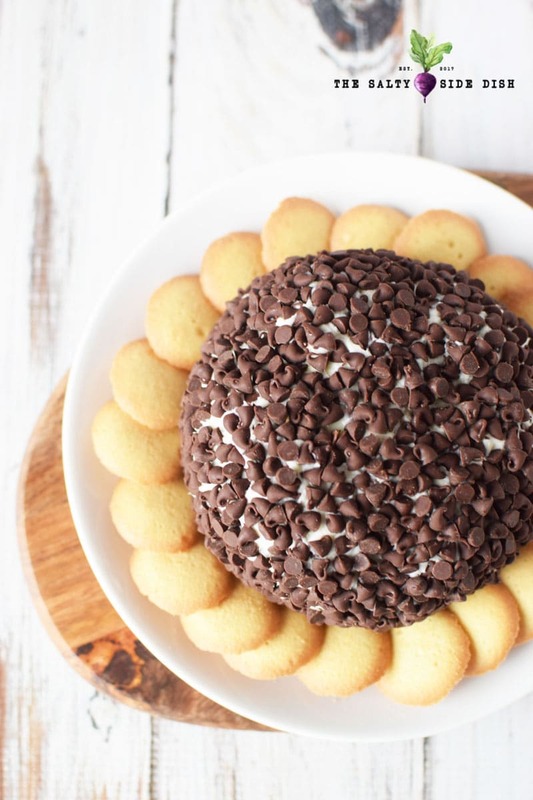 Who needs pico or taco dip, when every bite contains a cream cheese and mini chocolate chip wafer. Tonight we are having a get together at our house and usually the adults do not care what we eat. I mean most adults eat a bit of everyting….but oy the kids. 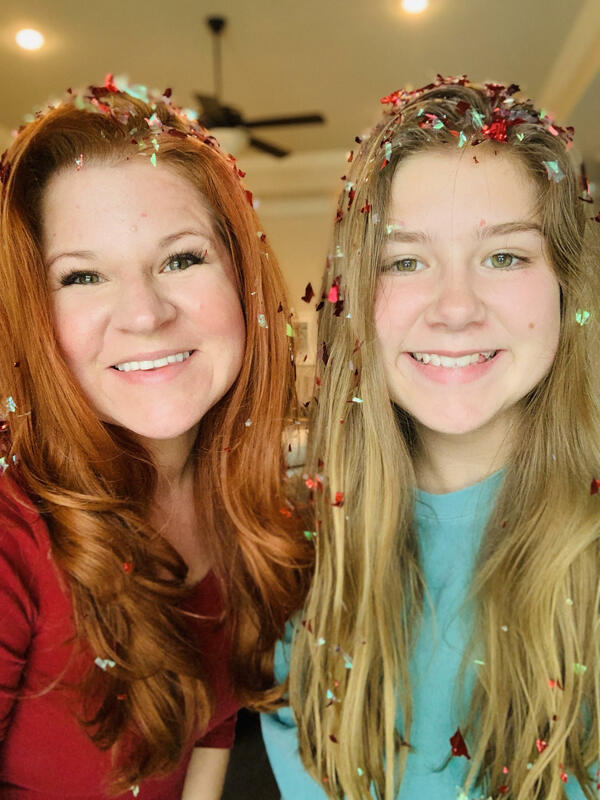 8 kids with totally different eating habits from snacks to meals and it always makes me scratch my head on what to serve that everyone will enjoy. 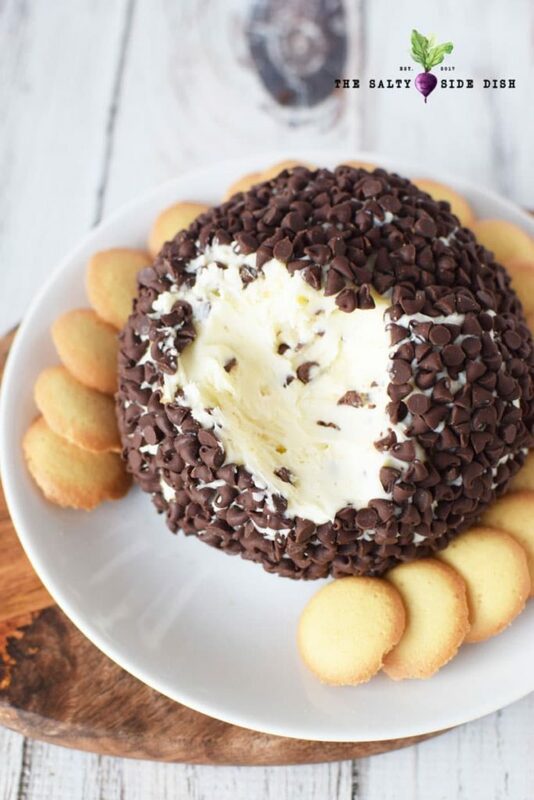 Cue the chocolate chip cheese ball. 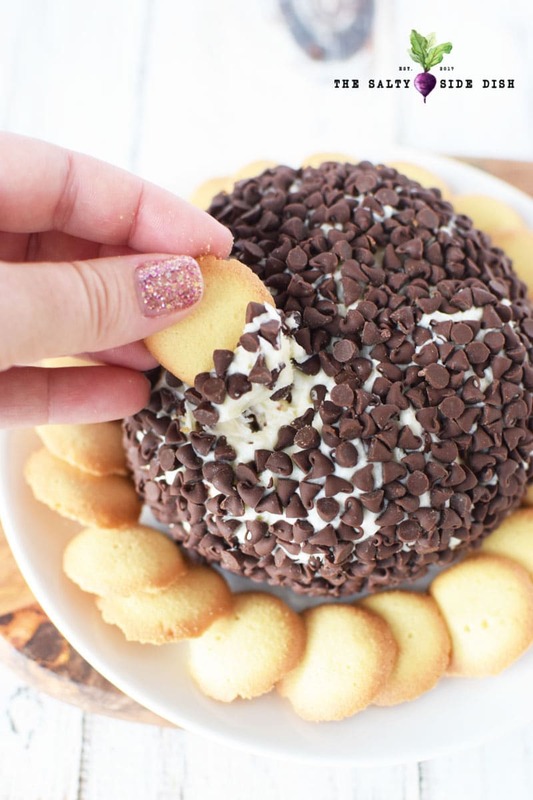 As if a cheese ball isn’t enough, this dessert appetizer (not so much a side dish!) is something the smallest to the tallest can enjoy. Keep in mind that this one needs to be prepped ahead because it has to chill and firm up into a ball. That means no making this one minute before everyone arrives unless you do it in a flat pan- which could be fine too. However if you want a traditional ball shape on a platter, you will need to form up and firm up prior to sitting out. Other than that, its easy as….cream cheese! Scroll down below for a printable version you can bring to the store with you. Looking for another amazing recipe to dip into? 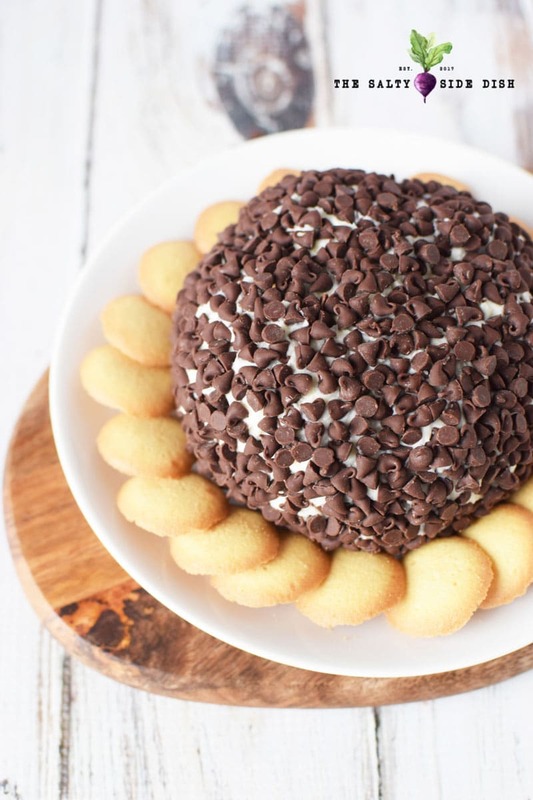 Try Chocolate Chip Cookie Dough Dip or this cookie cup recipe. 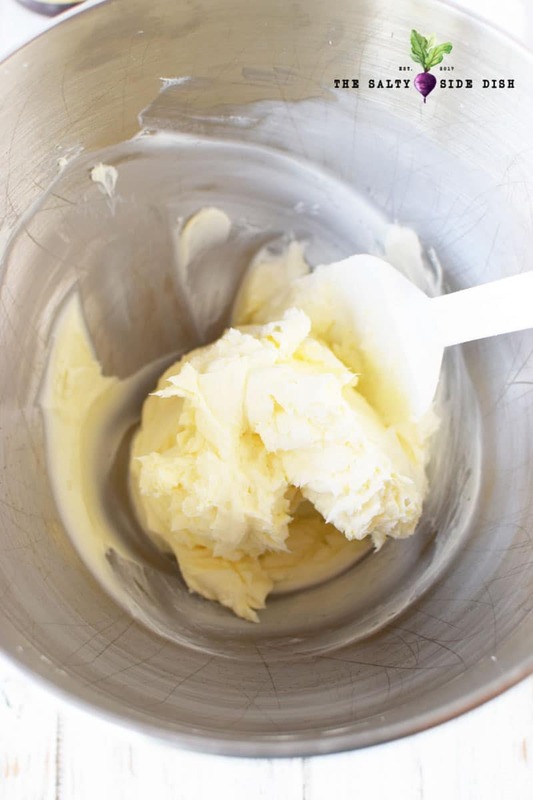 In a mixing bowl, add cream cheese and butter and beat well until combined. Add powdered sugar and vanilla and beat well. Fold in 1/2 cup of mini chocolate chips. Place onto a piece of plastic wrap and shape into a ball, wrapping the plastic wrap around the ball. 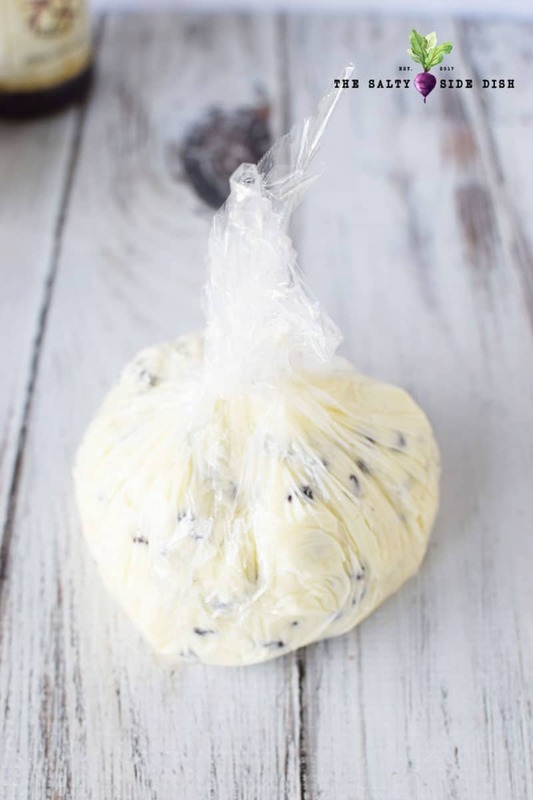 Refrigerate for 4-6 hours or overnight. 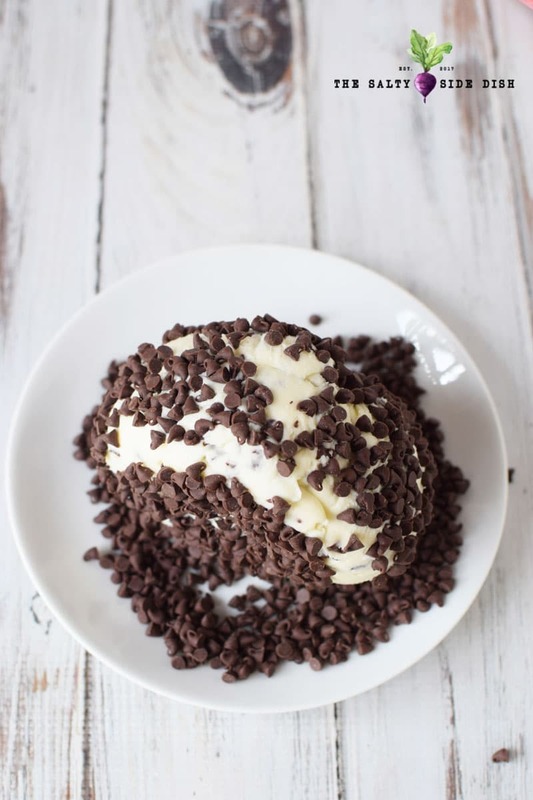 Add remaining mini chocolate chips to a plate and place the chilled ball into chocolate chips to evenly coat. Roll and gently use your fingers to press into the cheese ball. Serve with mini vanilla wafers or graham crackers. In a mixing bowl, add cream cheese and butter and beat well until combined. Add powdered sugar and vanilla and beat well. Fold in 1/2 cup of mini chocolate chips. Place onto a piece of plastic wrap and shape into a ball, wrapping the plastic wrap around the ball. Refrigerate for 4-6 hours or overnight. 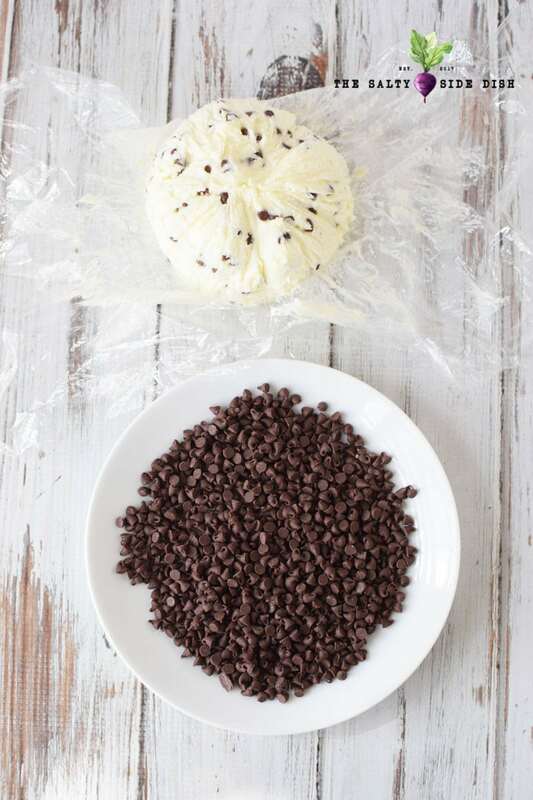 Add remaining mini chocolate chips to a plate and place the chilled ball into chocolate chips to evenly coat. Roll and gently use your fingers to press into the cheese ball.